Going into Arsenal’s final game of the Premier League season many would be expecting a drab affair, normally 1-0 or a 1-1 draw are the usual occurrences when there is not much left to play for, but Theo Walcott had something else in mind. Walcott has struggled for first team opportunities since being out through injury literally all campaign and has only made a handful of appearances, which would go someway to explain why Arsene Wenger has not rushed him back to the match day squad. 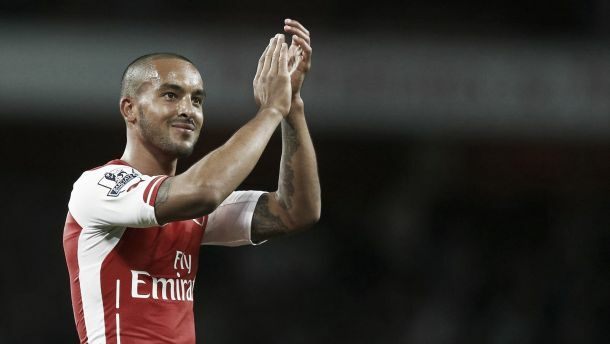 With the impending FA Cup final rapidly approaching, Walcott clearly felt he had a point to prove and given an opportunity in his much desired centre forward position he did not disappoint. The 26-year-old hit a first-half hat-trick in just 37 minutes, his first was the pick of the bunch firing hard and high into the top corner leaving keeper Boaz Myhill no chance. The timing could not come better for Arsenal ahead of their cup final against Aston Villa. Danny Welbeck has been the man asked to lead the line in the cup run this season as he looks to rest Olivier Giroud, who has not found the net in his last eight games. Walcott looks surprisingly sharp and it would be a brave man to bet against him starting at Wembley, he has all the attributes to cause Aston Villaproblems on a big pitch. If there is one thing the Aston Villa defence have succumbed to this season it is pace, only a few weeks ago they were embarrassed by the speed of the Southampton attack in a 6-1 loss and, if Arsenal approach the game with the same desire and tenacity, it could be a similar outcome. Last season Arsenal left it late at Wembley, winning in extra time 3-2 against Hull City, a final that Walcott missed through injury. The former Southampton winger will be hungry to make up for lost time and put to bed the demons of the last cup final he played in, the League Cup final loss to rivals Chelsea in 2007. There is still a lot to be made about Walcott‘s future and a big performance on Saturday would go a long way to securing that contract extension he so clearly craves.